Aristida coerulescens Desf., Aristida fasciculata Torr., Aristida submucronata Schumach. Common needle grass (Aristida adscensionis L.) is an annual or short-lived perennial, tufted xerophilous grass (Quattrocchi, 2006; Skerman et al., 1990; Burkill, 1985; Bogdan, 1977). Aristida adscensionis varies widely in its morphology (eFloras, 2010). The culms are thin, erect or geniculate, stiff, simple or branching at the lower nodes, yellow to bright green in colour, becoming straw coloured when matured (Quattrocchi, 2006; Bogdan, 1977). The leaves are linear, narrow, up to 20 cm long (Bogdan, 1977). The inflorescences are panicles, up to 30 cm long, more often dense and narrow but sometimes lax and flexuous (Quattrocchi, 2006; Bogdan, 1977). The seed-heads are purplish with spikelets densely clustered on the branches. The spikelets are covered with three unequal, scabrous and 1-2.5 cm long awns, hence the American name six-weeks three awns or six-weeks triple-awn (Quattrocchi, 2006; Skerman et al., 1990). The seeds are very sharp (Quattrocchi, 2006; Bogdan, 1977). Species of the Aristida genus are all xerophilous grasses with stiff culms, narrow leaves covered with a thick cuticle well suited to dry climates (Gillet, 1961). Aristida adscensionis is mainly used as fodder though its nutritive value quickly declines as it matures (Skerman et al., 1990). It is a very important forage in dry areas, especially during periods of feed scarcity (Burkill, 1985). It is considered one of the best annual grasses in Arizona (Skerman et al., 1990). It is used to make poor quality broomsticks in India and for thatching, weaving, as well as making sieves and stuffing material for camel saddles in Africa. It is used in ethno-medicine as a lactation stimulant for women and to prevent itch and ringworm (Quattrocchi, 2006; Burkill, 1985). Aristida adscensionis is a warm-season grass native of many tropical, sub-tropical and warm temperate regions (Quattrocchi, 2006; USDA, 2013). It was introduced to the United States (Skerman et al., 1990). It is considered invasive in Hawaii and French Polynesia (US Forest Service, 2013). Aristida adscensionis is mainly found in dry areas with annual rainfall ranging from 300 to 380 mm. It grows from sea level up to an altitude of 2250 m. It is tolerant of drought provided there is occasional rain. 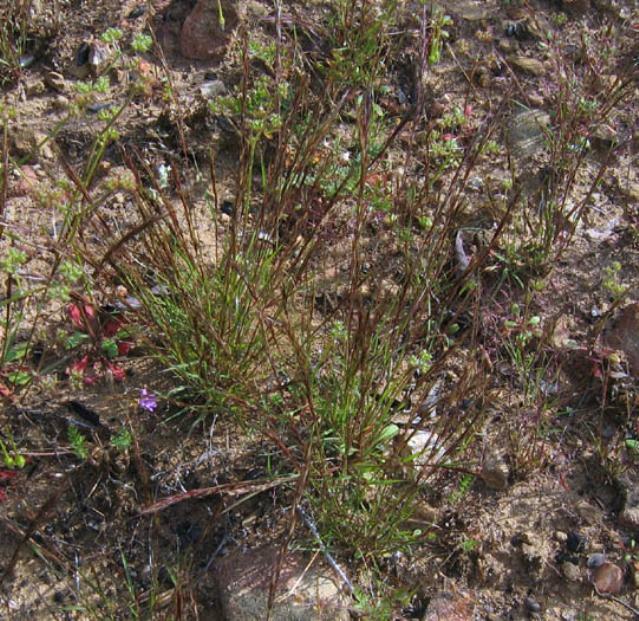 It can grow on many soils but prefers poor, rocky or sandy soils (Skerman et al., 1990). Aristida adscensionis is susceptible to shade (Varshney, 1966). It is found in disturbed poor soils in grassland and open bush throughout tropical Africa and even on walls (Quattrocchi, 2006, Skerman et al., 1990; Varshney, 1966). Aristida adscensionis is a major component of the Caatinga ecoregion in Brazil (Soares da Silva et al., 2011). It is mainly propagated by wind, sheep and goats: the awns are prone to wind transport and attach to sheep fleece and goat hairs (Ridley, 1930 cited by Varshney, 1966). Though mainly a summer-growing species, Aristida adscensionis can grow whenever moisture and temperature are favourable (Skerman et al., 1990). Aristida adscensionis can be sown or broadcasted in mixed swards with other annual or perennial grasses (Bogdan, 1977). However, it is not recommended to mix it with legumes as it may have an allelopathic effect on Rhizobium spp. (Murthy et al., 1977). Aristida adscensionis can become established on roughly prepared or unprepared soil (Skerman et al., 1990). Aristida adscensionis tends to become dominant under heavy grazing and high rainfall, but this should be avoided because of its low palatability and low ground-covering capacity (Fynn et al., 2001; Skerman et al., 1990, Varshney, 1966). Aristida adscensionis can be grazed or cut for hay. Its value as fodder is controversial: it is considered as unpalatable, poor-mediocre or fair in some regions but tender and nutritious in Brazil where its hay is valued (Bogdan, 1977). It was found to be well grazed at early stages of growth and avoided at the late-flowering and seeding stages because of sharp seeds and stiff awns (Quattrocchi, 2006; Bogdan, 1977). However, after the plant has dropped its seeds, the straw may be valuable fodder (Burkill, 1985). In Arizona, Aristida adscensionis can provide abundant feed for a short period (Skerman et al., 1990). Aristida adscensionis is a pioneering species that easily colonizes bare ground, waste and disturbed lands. It was found useful for the stabilization of sand-dunes in India and Senegal (Burkill, 1985). As a pioneer species, Aristida adscensionis may become invasive: it is an adventitious species on irrigation bunds and river banks in the rice growing area of Senegal (US Forest Service, 2013; Burkill, 1985). The information on the nutritive values of Aristida adscensionis is scarce. The crude protein content is 10% DM for fresh grass and less than 5% DM for dry grass. Fibre content is high, about 70-80% NDF DM (Feedipedia, 2013; Balgees et al., 2011; Soares da Silva et al., 2011). Aristida adscensionis has very sharp seeds that may injure animals, especially sheep. The seeds may cause eye irritation, or enter the sheep skin, causing considerable pain (Skerman et al., 1990; Baumer, 1975). This problem decreases once the seeds have been shed after ripening and the straw can then be fed to animals (Göhl, 1982). Aristida adscensionis supplies a useful fodder of poor or medium quality for cattle in dry regions. In tropical Africa, it is available for grazing in both the rainy and the dry seasons, and can represent an important part of forage intake during the dry season due to lack of better quality fodder (Burkill, 1985). In the early stages of growth, Aristida adscensionis can be well grazed by cattle or cut for hay but its nutritive values drops as it matures (Skerman et al., 1990). At maturity, triple-awned spikelets and sharp seeds make the plant unpalatable (Burkill, 1985; Skerman et al., 1990). Aristida adscensionis is poorly eaten by sheep. In North Pakistan, Aristida adscensionis, in a comparison of other grasses offered to sheep, was found to have one of the lowest potential intake rates (40.5 g consumed during 4 min) and relative preference value (42.5%) (Sultan et al., 2008). In China, after three months of heavy grazing by sheep, Aristida adscensionis was scarcely affected because of its hard and long awns (Nemoto et al., 1994). In vitro DM digestibility values between 23% and 58% have been reported depending on the season (digestibility is higher during the rainy season) and on the stage of maturity (early bloom forage is more digestible than mature forage) (Soares da Silva et al., 2011; Sultan et al., 2008). Aristida adscensionis could be considered suitable forage for feeding rabbits though no experiments have been reported in the literature (April 2013). This assumption is based on the selective grazing of Aristida adscensionis by the European brown hare (Lepus europaeus) in Argentina (Kufner et al., 2008) and by the black-tailed jackrabbit (Lepus californicus) and desert cottontail rabbit (Sylvilagus auduboni) in Texas (Flinders et al., 1977), even though Aristida adscensionis is rare in both areas.